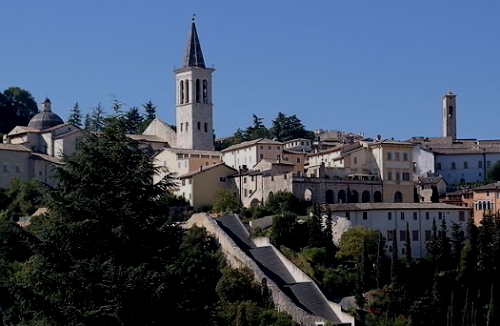 Spoleto Cathedral is thecathedral of the Archdiocese of Spoleto-Norcia created in 1821, previously thatof the diocese of Spoleto, and the principal church of the Umbrian city ofSpoleto, in Italy. 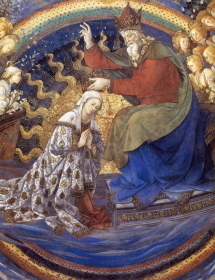 It is dedicated to the Assumption of the Blessed VirginMary. 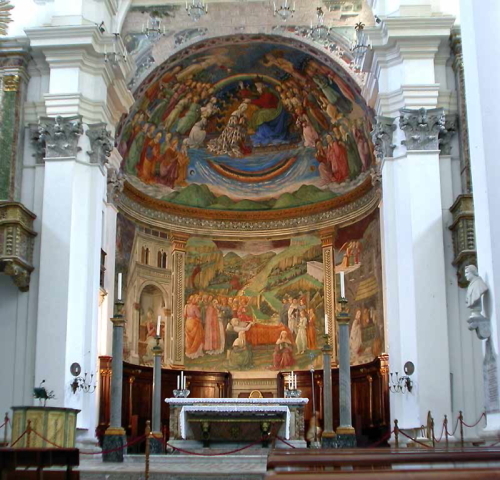 The church is essentially anexample of Romanesque architecture, with a nave and two side-aisles crossed bya transept, although subsequently modified. 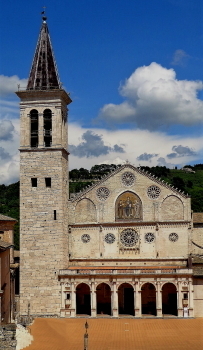 It was built from the second halfof the twelfth century after the city had been devastated by FrederickBarbarossa's troops, over an area where there had previously stood an earliercathedral, dedicated to Saint Primianus and destroyed by the emperor. A notable external porch and the belfrywere added in the fifteenth and sixteenth century respectively. The façade is divided into threebands. The lower one has a fine architraved door with sculpted door-posts. Twopulpits are provided on each side of the porch. 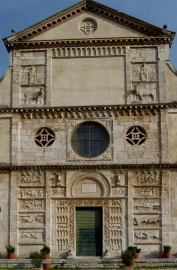 The upper bands are separatedby rose windows and ogival arches. The most striking feature of the upperfaçade is the Byzantine-hieratic mosaic portraying Christ giving a Benediction,signed by one Solsternus (1207). He signed his work with the inscription"Doctor Solsternus, hac summus in arte modernus", calling himself anoutstanding modern artist. Nothing else is known about him. 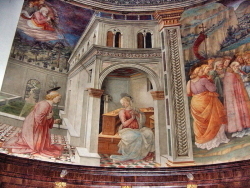 He was certainlyahead of his contemporaries, because it would take half a century before themosaics in Roman churches would surpass his style. The part of the belfrycontemporary with the church reuses Roman and early medieval elements. Theinterior was significantly modified in the 17th–18th centuries. 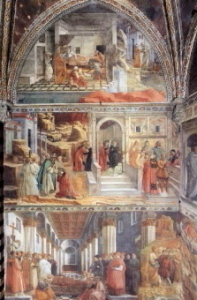 It has kept theoriginal Cosmatesque floor of the central nave and the frescoed apse. 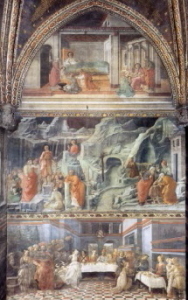 Thepaintings of the latter were finished in 1467–1469 by Filippo Lippi and hispupils Fra' Diamante and Piermatteo Lauro de' Manfredi da Amelia: they depictscenes from the Life of the Virgin. 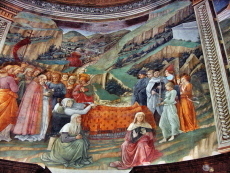 Lippi is buried in the south arm of thetransept.